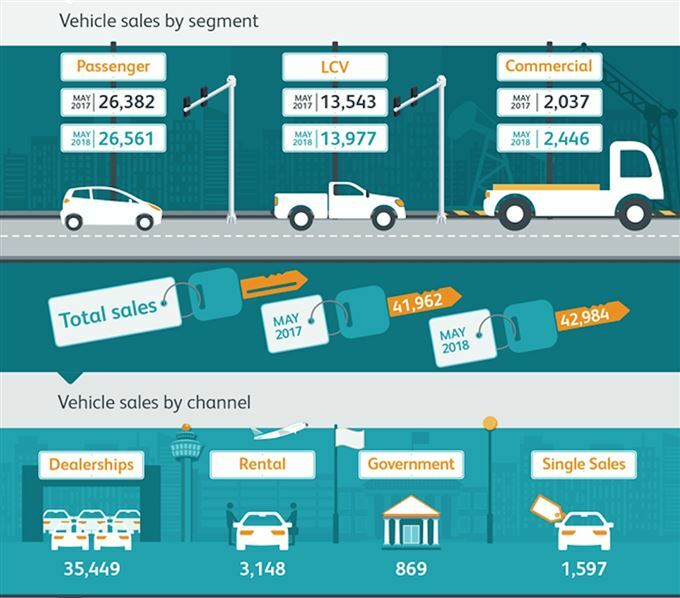 According to data released by the National Association of Automobile Manufacturers of South Africa (Naamsa), new vehicle sales are up by 2.4% year-on-year across all vehicle categories. A more holistic view of how the industry is performing comes from year-to-date data, where total sales over the first five months of 2018 are 1.6% down compared to the same period last year. A total of 220 783 new vehicles were sold in the first five months of this year, compared to 222 433 in the corresponding months last year. Although sales in the rental channel were up by a significant 52.6% year-on-year, they follow the same year-to-date pattern as the rest of the industry with sales 16.8% down. This is not surprising considering the particularly strong performance by rentals at the start of 2017. An exception to the year-to-date decline in sales came from the dealer channel, which grew 2.2%. Passenger vehicles in particular grew by 3.8% year-to-date. “Growth in the dealer channel is in line with the forecast announced at the Car of the Year banquet in March, and is further supported by WesBank’s application data which indicates retail consumers maintain a healthy appetite for new vehicles,” adds Msibi.